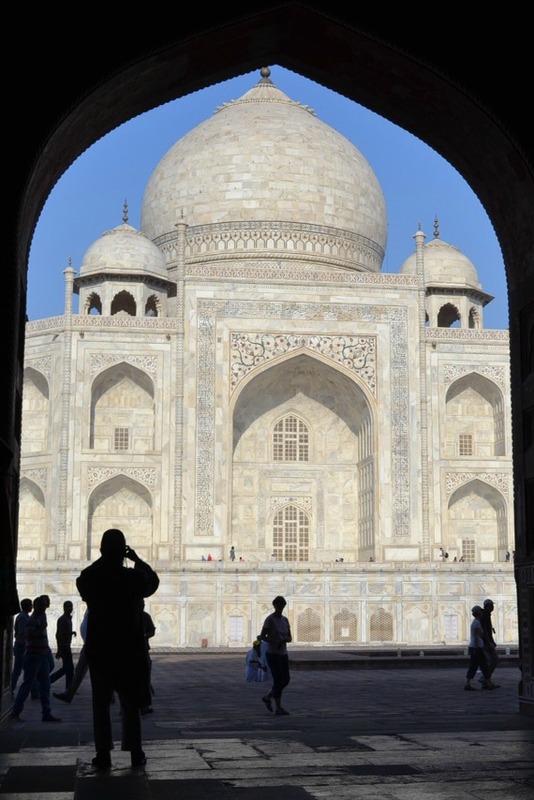 Visiting the Taj Mahal has been on my bucket list for as long as I can remember. I've always been entranced by the massive domes, the curved archways and the way the sun shimmers off the white marble. I finally got to see the Taj Mahal for myself when I visited India over Easter and it didn't disappoint. We arrived outside the Taj Mahal at 6.15am to join a queue of eager tourists sipping on chai tea. The ticket to get in costs 750 rupees for foreigners which is about £9.00 (prices and currency conversion from April 2013). You’re divided into queues of men and women because you’re searched when you enter so don’t take any lighters or anything sharp, flammable or any food. The gates opened at 6.30am and the queue began to hum excitedly as we shuffled in through the huge and impressive gateway. The red sandstone walls that surround the Taj Mahal ensure that you can’t see it from the outside and it means there’s an air of mystery about what’s on the other side of the wall. Of course, we all know exactly what the Taj Mahal looks like but it was still exciting! The Taj Mahal is a mausoleum built by Emperor Shah Jahan as a monument to his fourth wife who died after giving birth to their 14th child. 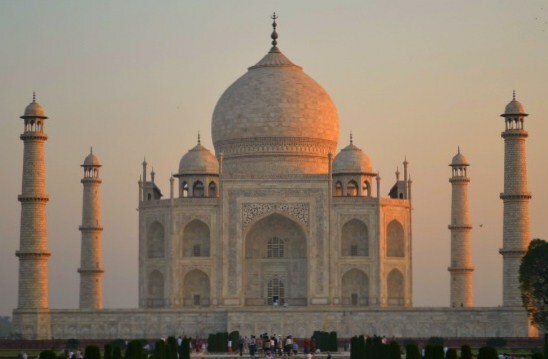 The Emperor wanted the Taj Mahal to be 100% marble but due to the weight it had to be made from brick and clad in the stunning white marble which comes from Varanassi. Building began in 1631 and took 20 years. 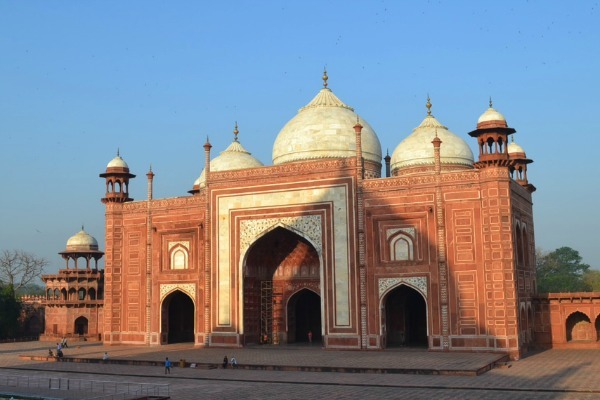 Soon after the mausoleum was completed, Shah Jahan’s son had his father imprisoned, presumably because he spent so much of their money building the Taj Mahal. Shah Jahan was placed in the Red Fort where he had a view over the Taj Mahal and stared at it for the rest of his days as he mourned for his wife. It is said that he cried so much while staring at the Taj Mahal hat he eventually went blind because of all the tears. I don’t know how true this is but whoever let the truth stand in the way of a tragically romantic story? The tombs of the Emperor and his wife are in an underground crypt but replica tombs can be visited inside. There are three other incredible buildings surrounding the Taj Mahal and I couldn’t help but feel a bit sorry for them. There is the Great Gate and a mosque which would seem stunning if you saw them on their own but when stood next to the Taj Mahal, they might as well be ugly office buildings. Get there as early as possible. The tourist buses start rolling it at around 9am so anything before then is best to avoid the crowds. Whatever time you go, it will be crowded so you need patience to get a good photo without someone standing in the way. Don’t give up, they’ll move eventually! To get ‘the money shot’ of the Taj Mahal, you need to join an informal queue by the edge of the pond and place your camera on the ground. This will ensure you get the water and a great shot of the whole building and it will also be straight and without any people in the way. Take as many pictures as you possibly can before the snappy happy tourists behind you start to get rowdy. They say that food and metal objects will be taken off you at security. In reality, I don’t think they’re that strict but it’s best it’s best to avoid having them to get through security quickly and easily. 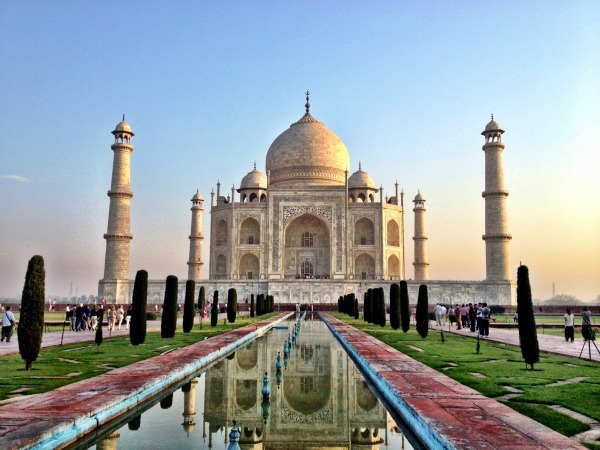 For a second chance to see the Taj Mahal, head to the gardens across the river. You only pay 100 rupees to enter and I went at sunset for a crowd-free Taj experience. 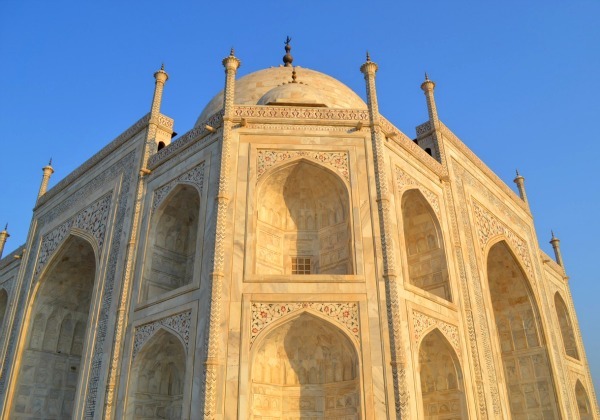 If you'd like to visit India, check out our flights to Delhi.